Hanging around my drinking buddies once again, I lamented the loss of the promising prospect from two weeks ago. "It's no use. I should have been born a hundred years ago." "What happened this time? She likes guitar Masses?" said George. "Or does she think holding hands for the Lord's Prayer is just peachy?" said Jack. "She must have been an iconoclast," speculated John as he set down his glass. "All they want is comfort," I complained. "Our Lord and Savior did not preach comfort!" Milton then took a gulp and offered his theory. "It was the air conditioning thing, then? That one will send them all away in tears." "You show me where Jesus tells us to take it easy and relax. It isn't there!" I continued whining. "Penance for the remission of sins-- that's what we're supposed to be preaching and living." "Yep, it was the air conditioning," concluded George. "No one is willing to endure that sort of penance." "So, look, why don't you just go to a church without air conditioning on Sunday and look there," reasoned Milton. "Any young woman who would endure a hot church in August for an hour might be worth a 'hi, how are you' from a guy such as yourself. Maybe she'll even be just as desperate for a guy who believes in penance and ask you out." "Watch that she's not too tough, though-- she might ask you out to the Rainbow Room afterward and say, 'we could take the stairs,'" mused John. "Hmm-- that all makes sense," I agreed as I imagined a beautiful young lady using her bulletin to fan herself in a sweltering church, just aching to find a gentleman to do the fanning for her. I finished my mango juice and resolved to find a church without air conditioning, certain that it would be well-attended by holy, unmarried ladies unconcerned with comfort. I was too late for the 9:15 AM train, and it was starting to drizzle, so I drove an hour and a quarter to a city with several unvisited parishes. I located one candidate but, as I started to walk toward it, I saw three large air conditioning units whirring outside the sanctuary. I revised my plan and went to a nearby parish with an 11:00 AM Mass; by contrast, its doors were flung wide open in a very welcoming way. The cornerstone reads "1882-1926," before the advent of air conditioning and other liturgical and architectural oddities. The building seems to be in the process of renovation, but whether it was untouched until recently or is being re-renovated is unclear. The sanctuary and middle of the nave were in a finished state but the sides looked as though side pews were recently removed, with sections of missing carpet, repaired but unpainted sections of wall, and construction materials evident. Some colored plastic chairs were scattered along the sides of the pews. Confessionals seemed to have been removed as well. The traditional, stained glass windows remain, but the domed sanctuary looks fully modern. To the left, underneath the tabernacle lamp, is a squarish structure that was fully covered with a cloth. It may have been the outgoing tabernacle or the incoming one; I'm not sure. I'm inclined to think the former, but if so I can't explain why it could not simply be removed as soon as it was no longer needed. Perhaps it was nothing of the sort. The current tabernacle is a square metal one on a pedestal all by itself underneath a traditional wooden crucifix at the center of the sanctuary. (Surely at some point a full reredo and high altar were here.) The side altars seem to have survived. The sanctuary looks as though it was pulled into the nave, displacing the first several rows of pews. This church probably seated 700-800 easily in 1926 but has been reduced to perhaps 300-400. A freestanding altar is at the center of the sanctuary; it was covered in green, but a plaster depiction of the Last Supper was separated from something and was leaning against the front. A wooden ambo is at the left. Towards the right front corner is a section for a piano. Racks in the light wooden pews that remain hold tattered copies of OCP's Music Issue from 2001. I was tempted to call OCP to report this, but I decided against it. I didn't want the company to send Robocop after the poor parish. I entered and took a place in the last pew in the front section; after I finished praying, I saw that a bulletin and a gift had appeared to my left. The gift was a slice of wood in the shape of a bear with a red cross painted on it. 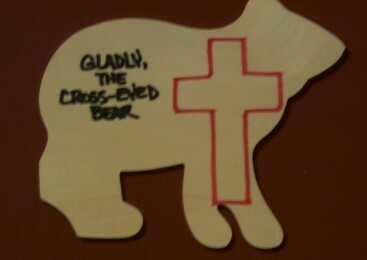 It bore the legend, "Gladly, The Cross-Eyed Bear." I found this completely puzzling as no explanation was offered, although I was relieved to see that the other thirty people in the congregation also had received wooden bears, so at least I had not been specially selected. A pianist played soft music as we waited. Mass started as the priest rang the bell near the sacristy door to the sanctuary and then emerged from the door to the side aisle, walked to the break halfway back, and then through the center aisle while someone in the music area played a hymn on a boom box. The priest used Form C of the penitential rite but omitted the Gloria. It could have been an oversight. A reader went to the ambo and gave the first reading. She led the responsorial psalm for the day and then left in favor of a relief reader, who gave the second reading. The priest brought a wooden stool to the ambo and placed it to one side before leading a sung Alleluia and proclaiming the Gospel. After that, he sat on the stool to give his homily. He is rather rotund and later mentioned that his back was bothering him, so perhaps he had legitimate cause for this. The homily began with mention of the HBO series "Six Feet Under." (That's "1.83 Meters Under" for metric fans.) A woman surprised the funeral director by asking him, "Why do we have to die?" He actually had a decent answer: "Because it makes life important." The priest (who had to wipe sweat from his brow during the homily) said that one motivational book has the slogan, "Begin with the end in mind." He focused on the paradox of the cross and said he really couldn't explain it fully. We recited the Creed, and then the relief reader led the recitation of the intentions of the Prayer of the Faithful. Two ushers took a collection using long-handled wicker baskets while the pianist played some music. The chalice and ciborium were of metal, but two additional glass chalices were also used. The congregation stood during the Orate Fratres invitation instead of waiting until it was complete. The priest omitted the Prayer over the Gifts. The priest offered the second Eucharistic Prayer. He asked us to join hands for the Lord's Prayer, but I had a whole pew to myself and half the pew ahead of me was also empty, so I was in no danger. On the other hand, no one offered me a sign of peace either. The prayer before the sign of peace was omitted. We sang the Agnus Dei in Latin. Note well-- at a parish such as this one, such a thing would likely have been unthinkable ten years ago. Latin is coming back, but it will take a while to become entrenched once again. Have patience, friends. Three extraordinary ministers distributed Holy Communion while the priest remained in the sanctuary. I'd say his back was an excuse, but he actually could have brought the stool and sat if necessary for the small number of people-- and he walked around the sanctuary most of the time. Give him the benefit of the doubt, but I'm not sure. Two ministers offered the chalice at either side of a single minister at the center aisle. Some music was played during Communion but I don't recall now if it was piano music or recorded music. After Communion, the two ushers took a second collection. I found their next action rather strange; the proceeds of the second collection were emptied into the same basket as the proceeds of the first collection. Why take two collections then? Next, the priest sat on the stool again and asked for a round of applause for the pianist as well as someone who was celebrating a birthday. He asked if anyone else had anything to celebrate, and I was getting concerned that with no large columns behind which I could hide, he'd look right at me and say, "Itinerant Worshipper, please stand and be welcomed!" Fortunately, he simply made a few more announcements. I believe that we also received the explanation of the wooden bear at this point; apparently, for Lent, the nuns in school taught the priest a hymn he thought was about a cuddly cross-eyed bear named Gladly. Only in the seminary did he suddenly realize that the hymn had nothing to do with a bear; it was "Gladly, the Cross I'd Bear." Thus, we received the little wooden bears today. Okay, it could have been lots worse. Finally, the priest offered the closing prayer and imparted a simple blessing. The priest left via the center aisle as another recording was played on the boom box. He went and stood at the side door by the parking lot, making me feel that I was wise to have parked on the street, allowing me to leave via the unguarded main entrance. The boom box operator lowered the volume after the first verse or so, which I took as a signal to leave. I looked around to see if any young ladies were interested in taking up their crosses and joining my merry band of penitents, but the women must all have been at the air-conditioned church across town. Sigh. Mass is offered in Monaco at St. Charles Church on St. Charles Avenue. All around the world, no matter where you may be, you can almost always find a Catholic Mass.